Story elements are one of my favorite things to teach. In my opinion, they are extremely critical for helping students become skilled readers of fiction. Most story elements can be found in quality fiction books, but you have to be careful when teaching problem, solution, and theme. Some books do not have clear problems, solutions, and/or themes. 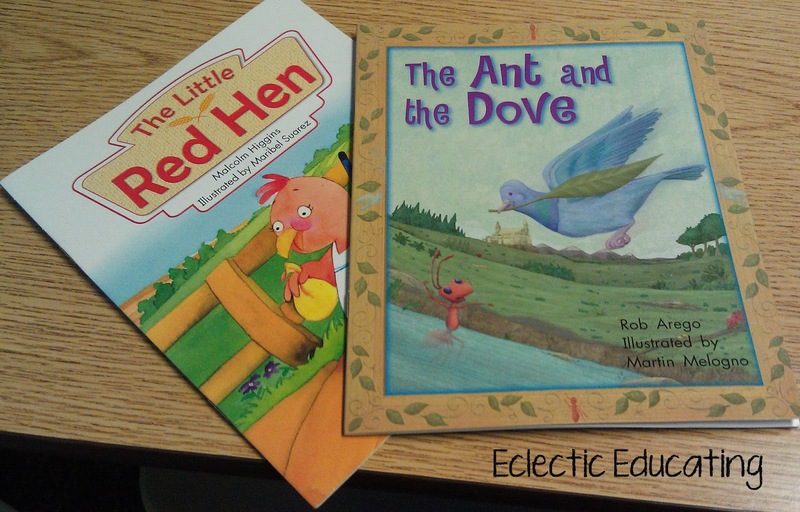 When teaching story elements, I often begin with fables, folktales, and fairy tales. These books usually have clear, distinct story elements. As usual, I began with an anchor chart. 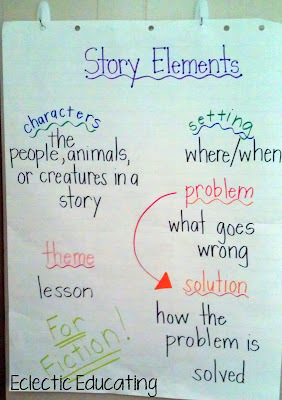 We talked about the different story elements, and I emphasized that these elements are found in fictional stories. It is always good to be explicit. Usually, I find that students struggle the most with finding the theme. They always want to speak in terms of the specific situation or characters. I am constantly reminding students that the theme is general, such as "Be nice to others." Not..."The crow needs to be nice to the hen." It usually helps to brainstorm a list of themes that students can refer back to. It really helps drive home the point. For the modeling portion of the lesson, I read aloud An Angel For Solomon Singer . I had never read this book before planning for this lesson. It was a HUGE hit. The kids were completely captivated. It is a beautiful story about a man who misses his home once he moves to New York City. He finally finds a place he can call home when he meets a man named Angel at a local diner. I would highly recommend this book to anyone who has never read it before. I modeled how to identify the story elements for this book with a story map. Students filled out these elements as I went over them. For the guided practice portion of the lesson, we read The Widow's Broom . (It also happened to be Halloween!) Together, we filled out the story map. Then, for the independent practice, I pulled a variety of texts at my students' reading levels. See what I mean about picking folktales and fables? These stories worked out perfectly for identifying story elements! 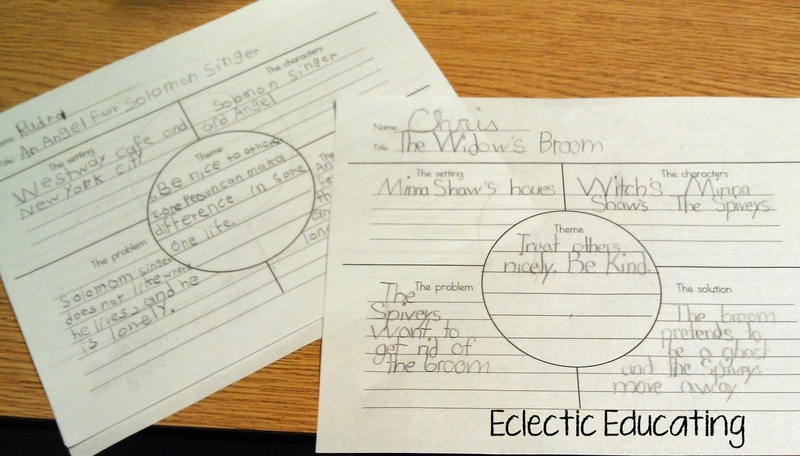 During this portion of the lesson, my students completed the story maps independently. 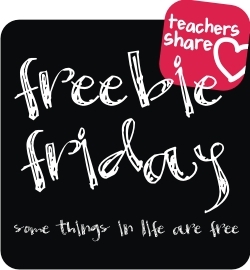 If you would like a free copy of the story map, click here! What are some of your favorite books for teaching story elements? I use fables too! Cute anchor chart! I agree that teaching story elements is so important and usually easy - I hate when we come across a book where the problem is not so clear or there could be two or more problems depending on your interpretation - makes it a little harder. Thanks for the organizer !